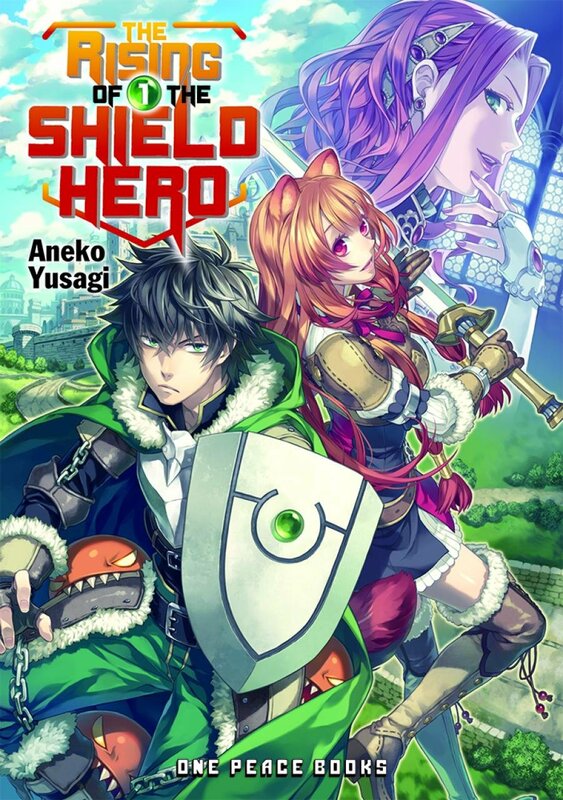 This review is for the first volume of The Rising Of The Shield Hero by Aneko Yusagi (with art by Minami Seira). The English edition was released by One Peace Books in September 2015. The second volume will release in October 2015. In Japan, there are currently 10 volumes released. The Rising Of The Shield Hero is an action-adventure fantasy romance about a 20-year-old otaku who spends his days on games and manga, until suddenly he finds himself summoned to another world. He discovers he is one of four heroes tasked with saving the world. As the Shield Hero, the weakest of the heroes, all is not as it seems. Naofumi is soon alone, penniless, and with nowhere to run, left with only his shield. Now, Naofumi must rise to become the legendary Shield Hero and save the world. Generally when it comes to the licensing of light novels in the West, many publishers would decide to wait until an anime adaptation to air to see if a series is worth picking up. Which is why I did not expect The Rising Of The Shield Hero to be licensed at all, much less by an unknown company in the English manga publishing market. But hey, who am I to complain about more light novel greatness coming to the West, right? One thing I enjoy about light novels would be how different the storytelling and settings are from English-written books. That’s why when I read The Rising Of The Shield Hero I couldn’t help but enjoy its different perspective on a more villainous protagonist. While the story isn’t anything you haven’t heard of when it comes to anime and light novel tropes, the characters are what push along the story and each character motivation progresses the story in ways you wouldn’t see coming. I feel what makes this story different from other fantasy light novels is how the author keeps realistic bounds for the characters, with motivations and goals that make sense for each individual. For each action there is reasoning behind it–whether it be good or bad–and this brings a fresh feel to an already familiar setting. Another refreshing thing is the lack of a harem (so far) and the great development between the two main leads that could lead to a relationship very soon. The writing style isn’t anything to write home about with its very simple “point A to point B” style, but the pacing was good, never taking too long to get things going and at the same time never feeling too fast as if we would breeze through the story. Overall with twenty-five chapters that average twelve pages each, this book really brings out the “light novel” feel of being able to read for 10-15 minutes, putting the book down and being able to pick it back up again without feeling lost. The translation is good enough in terms of word choice and the fluidity isn’t half-bad (but overall the translation could improve). While the translation never held back the story it felt more like a fan translation than a professional translation. Sometimes rather than making sentences more fluid and connect better, the translator chose to just make them short sentences that sometimes broke the flow of speech between characters. Regardless of these flaws, I still felt the parts of the story that needed to come through clearly came through perfect, so I can’t fault the translator too much. Overall if you’re interested in an action-adventure story this one is worth your time. Thanks for the review! I’ll be grabbing this on my kindle.